Fab Firsts is my new regular Sunday feature, that is going to be highlighting books that are firsts. When interviewing authors, it will be about their first book, as well as other firsts in their lives. When reviewing books for this feature, there will be a mix of debuts, first books in a series, the first time I read an author, and possibly other firsts depending on what I can think of! If you are an author wanting to take part in Fab Firsts then please do email on gilbster at gmail dot com and I'll whizz the questions over to you. I hope you enjoy this look at a variety of hopefully fabulous firsts, while making some sort of dent in my review and paperback TBRs which are my current main focus! Hello. I’m Lynne Shelby, and I’m delighted to be interviewed by Rachel for her Fab Firsts feature. My debut novel, ‘French Kissing,’ was published on 20th August 2015. 1) Can you tell us a bit about your first book? 2) What was your original inspiration to become a writer, and to write your debut? I can’t remember a time when I didn’t want to be a writer. I first submitted a novel to a publisher when I was fourteen. They didn’t publish it, but an editor sent an extremely kind letter encouraging me to keep writing. I wrote in various genres over the years, but about five years ago, I realised that what I really wanted to write was romantic fiction. 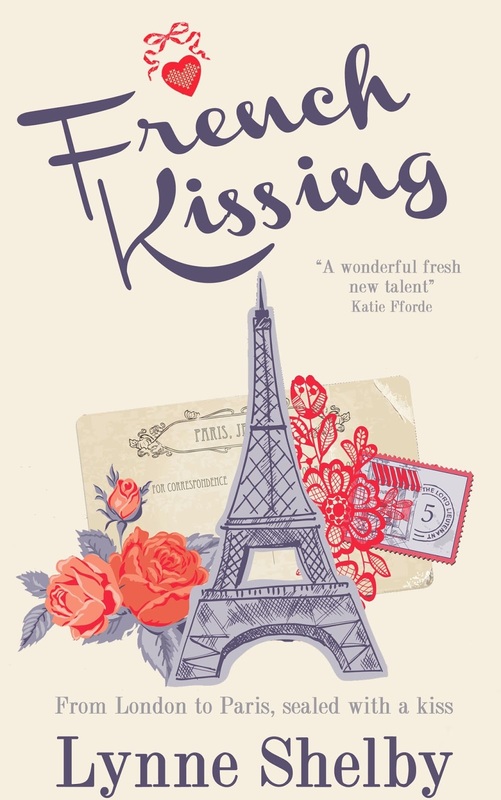 The idea for ‘French Kissing’ came to me when I was travelling home to London on the Eurostar with my family, and thinking that I’d like to write a story set in Paris, one of my favourite cities. A young Frenchman sitting across the aisle spent the entire journey phoning his English friends, telling them that he, François, was on his way to England, and suggesting they meet up, but none of them seemed to want to see him. I felt very sorry for François, but he gave me the idea to write a book about a Frenchman who comes to England and is very much welcomed by an English girl. 3) How long did it take you to write your first book? It was roughly a year. 4) If you could do anything differently in retrospect, what would you change about your debut, or how you went about writing it? When I was writing ‘French Kissing’ I edited it as I went along. I’ve since met so many other writers, who have been so generous with their advice to a newbie, and who have said that it’s best to get your ideas down on the page and then edit, and I’ve definitely taken their advice on board. 5) Was your first book self or traditionally published, and how did you go about making that decision? ‘French Kissing’ was traditionally published by Accent Press. Quite by chance, I saw that Accent and Woman magazine were holding a writing competition for women’s contemporary fiction, and asking for submissions of the first three chapters and a synopsis of a novel, with the prize of publication and a writer’s holiday in the south of France. I submitted ‘French Kissing,’ and was over the moon when I got a call from Accent to say that I’d won. 6) Do you have any tips for other first time authors? Ideally, try to write every day, even if it’s just for five minutes, so that the flow of your story stays fresh in your mind. At the same time, don’t beat yourself up if your other commitments mean that you can’t write for a while – it’s important for a writer to build experiences that can inspire their writing. Tell me about your first...? Prince Caspian by C S Lewis – with my pocket money when I was six. Unlikely as it seems, I have a memory of being on a ferry when I was two. Reader, I married him - having met him when I was fifteen and he was sixteen. A traditional seaside holiday in Bournemouth with my parents. A toy cat, which was first prize for ‘pin the tail on the donkey’ at a children’s party when I was five. David Bowie’s Aladdin Sane back in the days of vinyl – I’d only bought singles up until then. A dog I named Lobo which is Spanish for wolf. Not the most appropriate name for a West Highland White terrier, but I was only seven. When I was caught by a teacher talking in the corridor between lessons at school. My school was incredibly strict. Archaeologist. One day I’m going to write a novel with an archaeologist heroine. When I and my DH bought our first television together for our first home. When a teacher at my really strict school read out one of my stories to the class. A red rose from my now DH, then sixteen-year-old boyfriend. Thank you so much Lynne for answering my questions, I would definitely find a novel with an archaeologist heroine interesting and love the name of your West Highland Terrier. Lynne Shelby can't remember a time when she wasn't writing. She writes contemporary romance, because that's what she most likes reading. In 2015 she was thrilled to win the Accent Press & Woman Magazine Writing Competition with her debut novel 'French Kissing.' She loves travelling and is inspired to write by the many wonderful foreign cities that she’s visited and explored, with a camera and writer's notebook in hand - Rome, Milan, Barcelona, Madrid, Venice, New York, Copenhagen, Berlin and of course Paris, the city which inspired her to write 'French Kissing'. She also loves the theatre, and is currently working on a series of romantic novels set in the world of showbusiness.